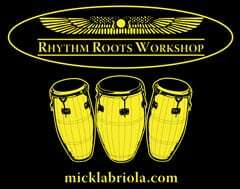 mick laBriola's Rhythm Roots Workshop combines traditional drumming techniques with a sense of cultural awareness and appreciation. Positive Vibrations Roots Reggae big band with Van Nixon vocals-guitar and mick laBriola drums-percussion-vocals; including bass, drums, guitars, keyboards, trumpet, saxophone and sometimes trombone. Karibuni African music quartet featuring Siama Matuzungidi, guitar-vocals-percussion-story teller; Lidia Wokolo Sanguma, dancer-singer-storyteller, Serge Akou, bass-percussion; mick laBriola, drums-percussion-vocals. Maqam Music of the Arabic World featuring Mohammed Lulu, accordion-vocals, and rotating members including David Stenshoel-violin, David Burk-oud, Salah Abdel Fatah-violin/oud, Dawn Doering on Nay and mick laBriola on percussion-drums. Ancestor Energy Ancestor Energy’s mantra is the juxtaposition of the amorous, enigmatic poetry of Louis Alemayehu and the prodigious, procuratorial, riveting jazz compositions of Carei Thomas, with David Wright III on reeds, Gary Schulte on violin and Mick LaBriola, percussion. Maroons The Maroons are a musical trio that plays the popular music of the English-speaking Caribbean Islands, including calypso and reggae. Mojo Roots MOJO ROOTS formulates an enticing aura of exuberance and boogie down jams, featuring Marcus-Guitar; Art Haynes-Bass; and Mick LaBriola, Percussion. Voices of Sepharad Active since 1986, Voices of Sepharad has performed to critical acclaim throughout North America and Europe, celebrating the rich multicultural world of Sephardic music, dance and storytelling. Beau Koo Jacks Founded in 2002 by Tom Zosel, John Eric Thiede and Paul Lagos, the Beau Koo Jacks are a tribute to the great New Orleans rhythm and blues sounds of the 50’s and 60’s. World Cafe International Instrumental Trio, featuring Violin, Percussion, Guitar, Oud, Saz etc. Arabic, Persian, Armenian, South American, Jazz, Celtic, Central African, Bulgarian, East Indian music, etc.